How are you doing? 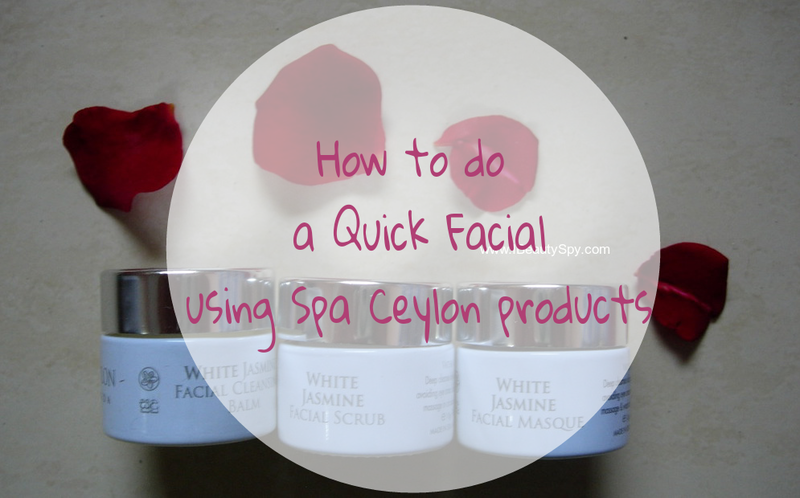 Today, am just doing a quick post on a quick facial routine using Spa Ceylon products. I actually didn’t mean to blog about it as they were just sample-sized products which I won in a contest. But after using it, I have been really impressed with the results and so thought of sharing with you and doing a separate post on it. I forgot to take swatches too as it was unplanned. How many of you love doing facials at home? Well, I do for sure. I usually do a facial on Sunday so I can be ready and charged to face work on Monday. Many of you might be really stressed about Mondays. I can understand that well. I too was once in such a job. But trust me, when you are in your dream job, you will actually look forward to Mondays and feel a little sad on Fridays. I was in such a dream job where I loved waking up on Mondays and going to office, running around with work, having coffee and mentoring others. Sadly, I lost my job due to a long illness. I hope I will get another dream job soon. So coming back to the post, as I said, I do facials every Sunday. I like to use ready-made facial kits or individual products depending upon what I have at that time. Sometimes when I have ample amount of time, I use all home remedies to do a complete facial. I will do a post on that too soon. This kit from Spa Ceylon was lying in my bag for a long time. I decided to try it and let’s see how it fares. Spa Ceylon White Jasmine Facial Cleansing Balm: I have used cleansing milks, but never used a cleansing balm before. I have heard that TBS has a cleansing balm. This is similar to that. It is thick and translucent. Once you take it in your hands, it melts into an oil which can be used for cleansing. It has a nice, soft jasmine fragrance which I love. I massage my face with it slowly. It removes all makeup effectively. It does leave some oily residue and so I use a face wash afterwards. My skin feels so soft, nourished and healthy after this step itself. So girls, if you are looking for a nice cleansing balm or makeup remover, do give this a try. Spa Ceylon White Jasmine Facial Scrub: The scrub is faint yellowish in color and has nice particles to give a thorough and smooth exfoliation. I have sensitive skin and many scrubs tend to break me out. I haven’t experienced any breakouts with this though. After using this, I can feel my face is brighter and some tan also is removed. 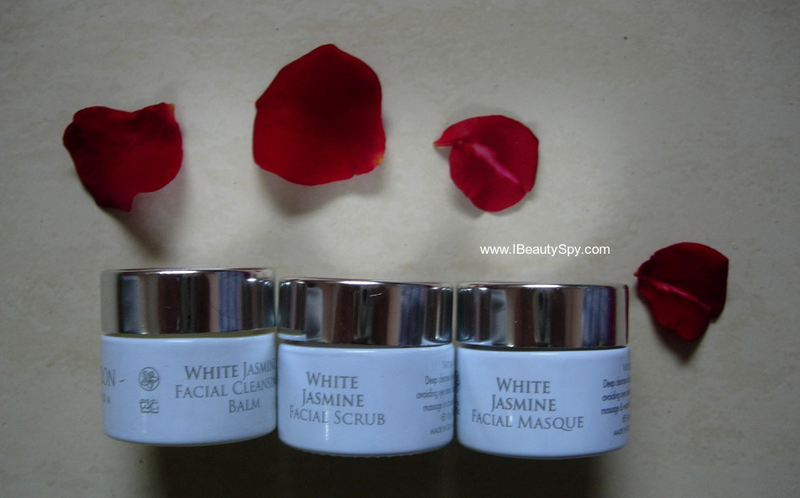 Spa Ceylon White Jasmine Facial Masque: The mask is also faint yellowish in color and has a pleasant jasmine fragrance. I apply a thick layer on my face and leave on for around 20 minutes. It doesn’t dry out my skin. My face now looks glowing and healthy. Some breakouts and redness I had were also reduced. Spa Ceylon White Jasmine Hand & Body Milk: This is not part of the facial routine. Just reviewing it. It is also faint yellow color and has a very thick consistency. Has the same pleasant jasmine fragrance which lasts for some time. But it is not moisturizing enough for my dry skin. Overall, I loved the three products Spa Ceylon White Jasmine Cleansing Balm, Facial Scrub and Face Masque. Using it as a facial made my skin look brighter, tan removed, healthy, nourished and glowing. It also reduced breakouts and redness. The samples lasted me for 3 facials. Am planning to get the full size versions when they are on a sale. If you have sensitive skin and wish to get a healthy, nourished and glowing skin this monsoon, I would recommend you to try these Spa Ceylon products, especially the cleansing balm is highly recommended. How do you do facials at home? Do you prefer to use kits or individual products or natural ingredients? Share your experiences in the comments. Yes, do try it. Its really awesome. It’s nice to hear that it works. Nice review. I have tried spa ceylon’s foot scrub and I love it. This facial range of products sounds nice. Got to give it a try. Now this looks too good!! The products sound nice! Great post! I am loving the facial kit. And these look like big sized products so that we may use several times. I hope you are fine now and wish for you to get your dream job soon,.. Nowadays I hate going to the work 🙁 as usual monsoon illness cold and fever make me feel so tired,,.. I have tried Spa Ceylon Spa Ceylon White Jasmine Facial Masque, but I have sensitive nose, smell of it was bothering, so had to remove it as soon as I applied,.. Nice review,..
Yeah… nobody wants to work when it rains. We want to snuggle inside our blankets drinking hot chocolate 😀 I hope you enjoy your job otherwise. Else find your dream job soon. We all living for a short time and job occupies a large proportion of the time. If we find a dream job, we can be really happy. Email me if you need any help or reference.